Super Saiyan Gogeta -This particular one was inspired by the fusion of Gohan and Vegeta in 'The Second Soul). This was my first real attempt at drawing Anime style, and I was tempted not to put it up. At the time I had never seen what the clothes of a fused person looked like so I went with plain old blue. 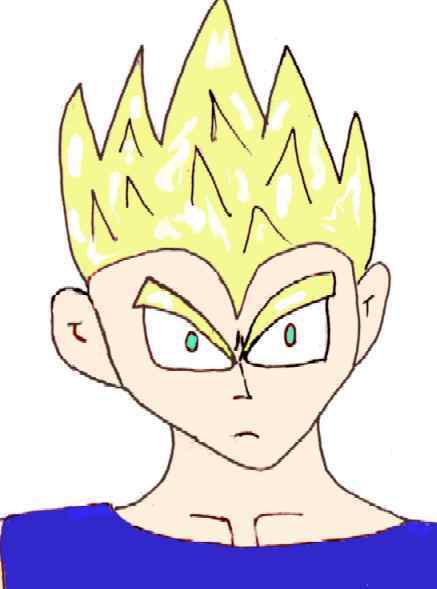 Goten- Once again from 'The Second Soul' this is poor Goten after he was been beaten up by Kakarot. You'll note that his clothes are rather odd, but here is an explanation in the story. Kakarot- This was originally a doodle in a school binder, but when I started working on it more fully, I decided I might as well post it.